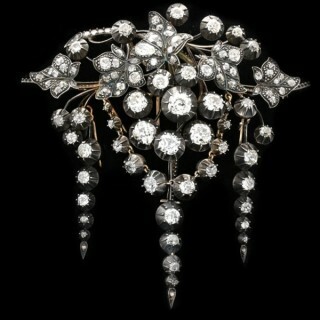 Impressive early Victorian diamond brooch. 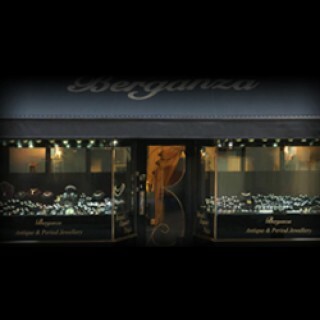 Centrally set with six cushion shape old mine diamonds in open back cut down settings with a combined weight of 8.50 carats, fitted above with thirteen cushion shape old mine diamonds in open back grain settings with a combined weight of 2.00 carats, flanked by twenty cushion shape old mine diamonds in open back grain settings with a combined weight of 2.00 carats, decorated with twenty cushion shape old mine diamonds in open back grain settings with a combined weight of 1.60 carats, surrounded by thirteen cushion shape old mine diamonds in open back cut down settings with a combined weight of 3.90 carats, suspending twenty four cushion shape old mine diamonds in open back cut down settings with a combined weight of 5.90 carats and embellished throughout with eleven round rose cut diamonds in closed back grain settings with a combined weight of 0.16 carats. 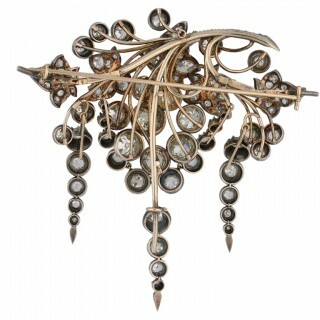 The total approximate diamond weight is 24.06 carats, to an elaborate open work brooch featuring five naturalistic curving leaf motifs surrounded by curving stems each terminating to intricate circular collets, suspending a removable, articulated, graduating swag and three additional removable, articulated, graduating drops, flowing with movement, the reverse features intricate backholing and is supported by ornate stems fitted with removable sections set with a secure swivel hinged pin and two C-scrolls, approximately 14.1cm in length and 9.6cm wide. Tested gold and silver, circa 1850. 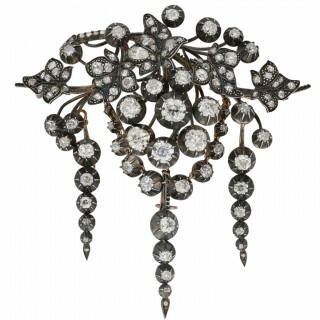 Impressive early Victorian diamond brooch, circa 1850.